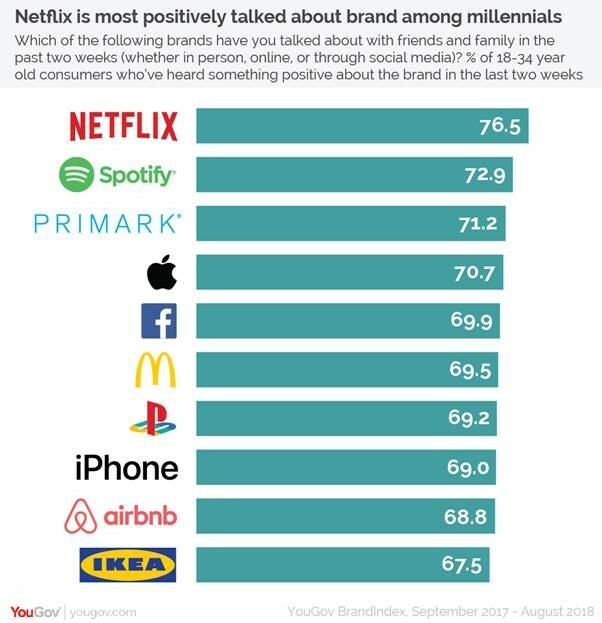 September 27, 2018, 9:32 a.m.
Netflix is the most positively talked about brand among millennials for the second year in a row, new YouGov research shows. For the second consecutive year the streaming service has topped YouGov’s Millennial Rankings, which considers which brands 18-34 year olds have discussed in favourable terms among family and friends. In a list that is yet again dominated by technology firms, Netflix sits at the top with a score of 77%, ahead of another tech giant, Spotify, which comes in second at 73%. Affordable clothing and retail brand Primark sits in third place alongside Apple (both 71%) followed by Facebook and McDonalds who both have a score of 70%. The rest of the top ten is made up of a variety of industries including gaming, travel and tech brands. PlayStation, Apple iPhone and Airbnb all share a joint score of 69%, and homeware giant IKEA (68%) rounds off the top ten. Netflix’s popularity shows no signs of abating. The streaming service continues to expand its offering, as well as investing in its own ‘Netflix originals’. By its very nature Netflix’s content invites discussion, and YouGov’s rankings show that the brand has certainly harnessed the power of word of mouth recommendations to gain a loyal following among a younger generation of viewers. As we would expect among this particular age group, other tech giants such as Apple, Spotify and PlayStation feature prominently in our rankings. However, there is a strong presence from ‘affordable’ brands - those which offer convenience at a competitive price point, such as Primark, McDonald’s, Airbnb and IKEA. The rankings also assess which brands have experienced the greatest uplift in positive Word of Mouth score over the past 12 months. Cinema chain Vue tops the improvers list, with a rise in score of 11%. It appears ahead of comparison site comparethemarket.com and Visa, which have both seen a change in score of 9%, followed by Google Phone (Pixel) and Thornton’s (both 7%). The rest of the improvers list is dominated by food and drink brands, with Flake seeing an increase of +7 points and Dolmio, National Lottery, Uncle Ben’s and Grey Goose all seeing a rise of +6. YouGov’s rankings are based upon YouGov BrandIndex’s Word of Mouth metric, which measures whether a respondent has discussed a brand with friends or family (whether in-person, online, or through social media) in the past two weeks. They are then filtered by positive Buzz - to sift out those who talk well of a brand from those who don’t – and age, so that only 18-34 year-olds’ views are measured.